In order to do proper diagnostics you will need a scan tool and some special tools available from Miller Special Tools. The high pressure pump builds the high pressure and delivers it to the fuel rail manifold where it flows through the injector lines and injector connector tubes to the injectors. The fuel pressure regulator (fuel control actuator) in the high pressure pump controls rail pressure. The injectors have a hollow check ball that holds rail pressure until the fuel solenoid is actuated by the ECM, this allows the check ball to rise off its’ seat and an injection to take place. If the injector connector tubes, where they seat into the injectors, leak or the check ball in the injector is leaking or the high pressure limit valve then it will not build enough rail pressure to start the engine. It takes approximately 4000 PSI rail pressure for starting. The fuel system contains high pressure fuel up to 26,000 PSI. Do Not use you fingers to find leaks! High pressure fuel entering your bloodstream may result in amputation or loss of life. Check for available re-flash updates. There are several for these trucks related to common problems. No or low fuel supply, should be 10-15 PSI at idle, to the high pressure injection pump (CP3). Verify CP3 pump output volume (see high pressure pump info). You can also cap off all the injectors and see how quickly the rail pressure climbs. It takes about 4000 PSI rail pressure in order to start. Shorted fan clutch, unplug fan and try starting again, possible codes P0483 or P2509. *Smoke may not be visible on DPF equipped trucks. The exhaust may need disconnected or a test pipe temporarily installed to diagnose smoking issues. A bad or incorrect torque on an injector connector tube, missing or damaged chamber gasket, low compression or excessive valve lash could all cause a miss. A bad dual-mass flywheel will cause the engine to shake and feel like a miss. Use cap off tool 9864 to block off one injector at a time. Leaking relief valves may also cause a surge at idle and erratic rail pressure readings. If the smoke clears in less than 1 minute, this would be normal depending on temperature and altitude. Blue white smoke that burns your eyes, is unburnt fuel, cold temperatures, high altitude and excessive idle time all mean cold combustion. Possible bad injector, leaking at the nozzle tip. Use the scan tool to kill one injector at a time to isolate. However, this does not reduce rail pressure in the injector and the tip can still leak fuel. Cap off the rail one line at a time (cap is tool number 9864) to pinpoint injector. Check intake heater operation when cold. Low or no supply pressure, supply pump or fuel filter etc. Excessive idle time can cause excess particulates when cold due to carbon build up on the injector tips. This can cause DPF restriction, plugging or more frequent regeneration cycles. More than 20% idle time is excessive. Upper injector o-ring, bad or not sealing. Cracked injector, remove valve cover and inspect for leaks while the engine is running. A leak will often look like a fog or haze of fuel. Leak at the high pressure pump drive shaft seal. All 6.7l engines use an in tank style supply pump like the later 5.9l engines. There are also supply pumps that mount on the frame rail and replace the in tank supply pumps, such as the FASS pump. Test the supply pressure at the inlet to the CP3 pump. Normal pressure is 10 PSI at idle and they typically drop close to zero PSI under load. Zero supply pump pressure will not damage the CP3 injection pump like it does the earlier Bosch VP44 pump on the 5.9. Most starting problems due to low pressure are caused by bad (eroded check ball seat) injectors. You can unplug the fuel control actuator and the pressure should default to maximum (26,107 PSI), however if there is a leak in the injection system then the pump will not build enough pressure. If there has been a major contamination issue with dirt and or water then it is very likely that the high pressure pump will need to be replaced. The injectors are typically damaged first, but any contamination that got into the injectors also went through the CP3 pump. Volume test; the CP3 pump should discharge 70 ml (at 150 rpm or 90 ml at 200 rpm), from the CP3 to rail manifold fuel line, in 3 10 second cranking intervals (total of 30 seconds cranking). Remove the discharge line from the CP3 pump to test out put. There is a return specification for the CP3- Less than 1150 ml/min at idle. The CP3 on these engines must be “phased” when installed to reduce injector cackle. There is a timing procedure in the service information. It takes about 4000 PSI rail pressure in order for the injectors to deliver fuel for starting. Maximum allowable leakage for all injectors combined is 160 ml per minute: check when coolant temperature is above 180 degrees, 1200 rpm and fuel rail pressure is equal to 20,305 PSI. Any injector contributing more than 40 ml is excessive. IE: if total leakage is 200 ml and blocking off number one injector reduces the total leakage to 160 ml, cylinder number one injector has excessive leakage and is bad. Excessive leakage from the injector is returned to the fuel tank via the fuel return system, you will not see an external leak. If you have a no start condition, maximum allowable return is 90 ml per minute at 200 rpm cranking speed, be careful not to over heat the starter during testing. Damaged or loose high pressure injector connectors can cause excessive leakage. Excessive leakage usually results in a starting issue, which could occur hot or cold, but usually occurs hot because the fuel is thinner when hot. The 6.7l injectors have “IQA” codes on them, which are unique to the injector and must be programmed into the ECM when they are installed. The IQA codes give the ECM specific fuel flow quantity information so it can adjust delivery in the engine accordingly. Failure to program these codes may cause injector cackle, slight rough run, or excessive emissions. Some tuners may corrupt the IQA codes, or not allow programming of them without a re-flash. If you are unable to enter the IQA codes with your scan tool, because it errors out, you may need to update the ECM to the latest programming. The diesel particulate filter traps soot from the exhaust to lower particulate emissions. During certain driving conditions the engine will perform a regeneration cycle, which will use additional fuel injections and the catalyst to heat up the exhaust temps to the point where the soot will be burnt out and form ash. Over time the DPF will become “ash loaded” and need replaced or cleaned. Any engine drive-ability issues or fuel system failures will cause premature plugging or failure of the DPF. If the DPF is plugging repeatedly or requiring excessive regeneration cycles there is probably another problem with the engine, fuel system, or EGR system. DO NOT reset the DPF timer unless the DPF has been replaced or cleaned (removed and cleaned, not regenerated in the vehicle). The ECM keeps track of fuel used, soot, and ash load. Excess soot and ash load will result if the timer is reset without replacing or cleaning the DPF. If the DPF has been deleted, customers will have run-ability issues if they do not have the correct software. We have also seen EGR related issues that do not set codes with delete software installed. These problems may cause heavy smoke and low power, as well as some other symptoms. A plugged DPF can cause a turbo failure by forcing exhaust under excess pressure around the turbine shaft seals. Low boost/low power complaints must be diagnosed properly and completely prior to repairs! Excessive idle time will also cause DPF restriction due to particulate build up at idle. This will cause poor mileage (zero MPG when idling) due to more frequent regeneration events. Excess idle time could be defined as leaving the pick up running while hooking up a trailer. Use of the exhaust brake, which cycles the turbo to a 100% closed position, can help reduce carbon build up. Occasional hard acceleration, when the engine is warm, will help reduce carbon build up. Reducing idle time, an example of excess idle time would be leaving the engine running while hooking up a trailer. *Use the following information regarding diagnostic trouble codes ( DTC ) in addition to the normal diagnostic procedures outlined in the service manual or technical service bulletins. DTC P000F; fuel system over pressure relief valve activated. Sets when fuel pressure deviates from the set-point at a rate higher than the calibrated amount (drops quickly). Often sets along with P0087. Will set if turbine shaft speed exceeds 130,000 rpm. This can be caused by either a mechanical failure or electrical failure. A charge air cooler hose blowing off under load will cause the turbo to temporarily over speed and may set this code. The turbine shaft speed sensor in the turbo center section can fail and cause this code. The sensor should ohm between 600-1200 ohms across its two wires. Can be caused by low fuel supply pressure. Restricted or plugged fuel filter. Any leaks on the high pressure side fuel system such as injectors, high pressure connector tubes, etc. Note: connector tubes or bad injectors will not show up as an external leak, the leak will be excess fuel return, which returns to the tank. Most commonly caused by soot accumulation in the EGR valve, causing the valve pintle to not move and/or seat properly. We recommend replacing the valve because cleaning is not always a successful repair. Check and clean the Exhaust Gas Recirculation (EGR) valve and passages. Recheck after cleaning the valve. If the codes reset, the EGR valve should be replaced. DTC P0148; high pressure common rail check-sum, this is a deviation between the fuel pressure set point and the actual fuel pressure. FCA, check for rust on the fuel control actuator, which could indicate other fuel system problems caused by water contamination. Lift pump or fuel supply issues, check fuel supply pressure and fuel filter condition. Even though the code description identifies this code as a circuit code, the code can be triggered by actual rail pressure being too low. Monitor actual vs. desired rail pressure under heavy load. If rail pressure deviates more than 1000 PSI from desired, diagnose the low pressure and high pressure fuel system. Check the fuel rail pressure sensor voltage at key on engine off. It should be about 0.5 volts. If the fuel rail pressure sensor does not output the correct voltage, verify the 5 volt reference is present at the sensor. To check the ground wire, check for voltage by back probing the connector with it connected. There should be less than 50 mV on the sensor ground. If all of the above checks OK, replace he sensor. Restricted air flow (caked dirt and bugs) through the intercooler and radiator. Fuel Control Actuator (FCA) bad, use the scan tool to verify rail pressure set point versus fuel pressure. Normal idle pressure is 6000 – 7000 PSI. If you have a fluctuation over 500 PSI this can cause a surge as well. Similar to P0087, sets when there is too large a deviation between actual and desired fuel rail pressure, actual being too low. Can be caused by a plugged fuel filter, low fuel supply pressure, high pressure side fuel system leakage. Usually the result of improper driving habits, such as excess idle time, not enough full load (towing), too few highway miles, excessive short trips, or fuel system issues. The ECM will set this fault if it has detected that the soot level has exceeded the normal desoot trigger threshold by a sufficient amount to require driver intervention. Typically sets if the truck has not been able to perform an active regeneration due to light/no load operating conditions, such as idling or short trips. Often sets in conjunction with P242F. May require stationary regeneration or removal and cleaning of DPF. Can also be set if the CDR valve or vent tubes are restricted, or if he engine has excessive blow bye. This code will set when crankcase pressure is very excessive, such as the vent filter being completely plugged or excessive blow bye. If the vent filter is completely plugged it can force oil around the turbine shaft seals in the turbocharger and cause blue-white smoke. The PCM monitors the engine’s fault code status to determine if any fault codes critical to successful engine operation are active. If there are such codes, this code will also set. The other codes must be addressed to clear this fault. The PCM monitors the efficiency of the DPF soot level using data received from the Exhaust Differential Pressure Sensor, which monitors the restriction across the DPF. The PCM monitors the restriction in the DPF at various engine speeds/loads and will set the fault if the restriction is below a calibrated threshold minimum value. Any failures or modifications that reduce pressure ahead of the DPF may cause this code to set. Inspect the exhaust system for any signs of leakage or modification, including the exhaust manifold and EGR system. Inspect the entire air intake system, before and after the turbo, for any modifications or leaks. Verify that the DPF pressure sensor is at or very near 0.0 key on, engine off. Also, if the sensor was recently replaced, make sure it is plumbed properly. An internal DPF failure causing a reduction in restriction will cause this code to set. DTC P2262; turbocharger boost pressure not detected, mechanical. Make sure the ECM has the latest updated software. The WiTech scan tool has a test specific to this code. The code must be stored in the ECM in order to run the test. The test will recommend whether to replace the turbo, run the cleaning procedure, or if no repairs are needed. There are several TSB’s on this subject. Actuator failures are common on these turbochargers, and can be replaced separately.The actuator is usually only part of the problem however. The variable sleeve and actuator linkage also wear and carbon up, causing erratic movement and premature actuator failure. DTC P242F; diesel particulate filter restriction. Usually just what it says, excessive restriction due to soot and/or ash. Other problems need to be diagnosed with the fuel system, EGR system, and/or engine if this is a reoccurring problem. Excess soot from any system failures will cause premature DPF plugging. Basically indicates that the VGT actuator is not making a full sweep in during the key on/engine off self test. This code is almost always caused by either a bad VGT actuator or sticky turbo vanes. The 6.7L engines tend to have more head gasket failures then he 5.9L engines. The symptoms of a head gasket failure are typically coolant venting from the coolant overflow bottle and excess coolant temperature. Manual transmission equipped trucks with failing dual-mass flywheels commonly have other symptoms that are associated with engine balance, such as miss-fire codes and poor balance rates. We have seen fan clutch wiring get caught in the radiator fan due to the engine shaking badly, and also transmission bell housings broken on the upper driver’s side. Turn the ignition on, but do not start the engine. Depress and release the brake pedal two times. Fully depress and release the accelerator pedal slowly two times within 10 seconds. If the message comes back on when you turn the key back on, the indicator did not reset. This procedure may need to be repeated a few times to get the indicator to reset. The fuel system contains high pressure fuel up to 25,000 PSI. Do Not use you fingers to find leaks! High pressure fuel entering your bloodstream may result in amputation or loss of life. Ensure that you have a good clean fuel supply and good supply pressure. Shorted fan clutch, unplug fan and try starting again. Use cap off tool 9011 to block off one injector at a time. Poor battery connections, bad batteries and/or battery cables. If the smoke clears in less than 1 minute, this would be normal depending on temperature and altitude. Blue white smoke that burns your eyes, is un-burnt fuel, cold temperatures, high altitude and excessive idle time all mean cold combustion. Possible bad injector, leaking at the nozzle tip. Use the scan tool to kill one injector at a time to isolate. However, this does not reduce rail pressure in the injector and the tip can still leak fuel. Cap off the rail one line at a time (cap is tool # 9011) to pinpoint injector. Low compression in one or more cylinders. 2003 and 2004 model years originally had the supply pump mounted on the fuel filter housing. Most starting problems due to low pressure are caused by bad (leaking check ball seat) injectors. 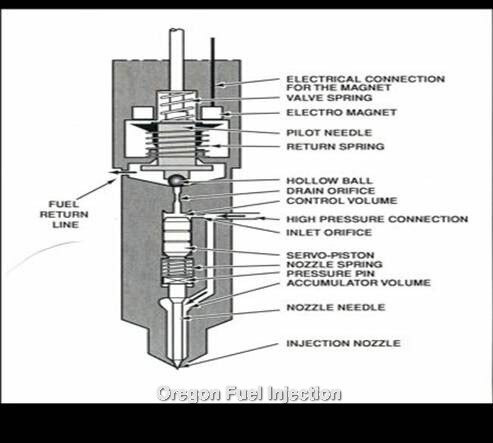 You can unplug the fuel control actuator and the pressure should default to maximum (23,500 PSI), however if there is a leak in the injection system then the pump can not build enough pressure. If there has been a major contamination issue with dirt and or water then it is very likely that the high pressure pump will need to be replaced. The injectors are typically damaged first, but any contamination that got into the injectors also went through the CP3 pump. Any injector contributing more than 40 ml is excessive. IE: if total leakage is 200 ml and blocking off number one injector reduces the total leakage to 160 ml, cylinder number one injector has excessive leakage and is bad. DTC P0148; high pressure common rail checksum, this is a deviation between the fuel pressure set point and the actual fuel pressure. Ground the Brown/Orange wire at the fan clutch connector (’04.5+). The fan should slowly start to spin faster. This may take 30 seconds or more. Verify that there is 12 volts on the Gray/Pink wire. If the wire has 12 volts and grounding the Brown/Orange wire does not make the fan engage, the fan clutch is faulty. Fan speed should be close to engine RPM when engaged and read with a scan tool. When the fault occurs, the “Wait to Start” lamp will turn on and a chime will sound 10 times. “Motoring” is when the engine is running, but requires no fuel injection (coasting with foot off the throttle). Check for other fuel system related codes. If there is any, address them first. If not, perform the checks outlined under P0148 and Injectors above. When the fault occurs, the “Wait to Start” lamp will turn on and a chime will sound 10 times. The ECM sets this code when calculated fuel flow exceeds an expected value. An engine derate is enabled when the fault sets, and will automatically return to normal when the fault is not detected. Essentially a low battery voltage code. Check batteries, battery cables, and battery connections. Any amount of corrosion or loose connections will cause this code to set. This is the most common of all complaints on the 1998.5-2002 Dodge Cummins with the Bosch VP44 injection pump. Being more descriptive about the specific complaint will improve diagnostics. The complaint may also be described as “loss of throttle”, “no throttle response”, or “intermittent low power”, “engine only idles” or “poor throttle response”. This complaint may show up hot or cold. In our experience it is often when the engine is cold, and the customer complains of losing throttle response when pulling out into traffic. There a few causes for this complaint but the vast majority are internal VP44 failures. The others are as follows: faulty throttle position sensor (APPS), defective MAP sensor (not sending a boost signal to the ECM for reference), a defective aftermarket performance box that ties in with the MAP and/or APPS sensor, OR least commonly a faulty ECM. The problem will most likely be an internal VP44 fault caused by low or no fuel supply pump pressure. This causes the advance piston to stick in the advance housing bore due to cavitation damage. Another cause could be from faulty lead free soldered connections that fail over time in the pump PSG. In order to properly diagnose this complaint all of the other possibilities must be eliminated because there are often no codes stored in the ECM in conjunction with the complaint. There are cases where a P0216 code (pump timing failure – advance operation) will be stored in the ECM in conjunction with the complaint which makes diagnostics somewhat easier, but it is still important to do thorough diagnostics. The supply pump is critical for the longevity of the VP44 injection pump. The supply pump should maintain at least 4psi at the inlet to the injection pump on a W.O.T. test drive. Failure to maintain a pressurized flow of un-aerated fuel will cause injection pump damage. 4psi at the inlet to the injection pump with a clean fuel filter allows for a pressure drop across the fuel filter when it is dirty. According to Chrysler, pressure doesn’t matter, only volume. The problem with their volume test with an unrestricted flow is their specifications for volume aren’t high enough. Some vehicles with the updated in-tank supply pump won’t maintain a positive pressure during a test drive. When the supply pump in the injection pump is pulling more fuel than the supply pump in the tank is pushing, then pressure becomes a vacuum because volume isn’t high enough. Continued driving, when the fuel is under a vacuum, can cause cavitation, which will damage the injection pump. In order to maintain good fuel flow, especially with performance modifications, you may need to add an aftermarket supply pump. If the vehicle is equipped with an aftermarket supply pump system, be aware that there may be an inline fuel filter in the fuel supply line prior to the supply pump. This filter should be changed at the same interval as the other fuel filter(s). Low or no fuel supply pressure, restricted fuel filter(s). Dirty air filter or inlet restriction. Exhaust leak before the turbo. MAP sensor can go bad and not set a code, check reading with scan tool versus actual. This can be erratic and sometimes be confused with a “dead pedal” complaint that can be caused by a sticky advance piston, which usually sets a P0216 code. MAP sensor displays on scan tool as absolute not gauge pressure. No fuel – sending unit in tank defective. If the supply pump recently failed, it could damage the injection pump and cause a no start. Check for DTC, follow Powertrain Diagnostic Procedures Manual. Injectors bad; check injectors, remove injection lines and crank engine. Do any of the injector feed tubes pump compression back out while cranking? Replace injector, if needed. Follow the same guidelines as no start. If supply pump recently failed, it could cause injection pump problems due to cavitation damage. If the vehicle is a 98-00 there may be a re-flash for hard start, refer to TSB 18-015-00. This problem can show up at any time or mile range, but usually after the supply pump is replaced. Leaking injector tubes (internally) may also cause a miss. If they leak externally, they are also leaking at the injector connection. No or low fuel supply pump pressure, restricted fuel filter(s). DTC present? Look at solving the codes first. If you have black smoke and no DTC, possible bad injectors. Possible speed sensor issue inside injection pump, which may not set a code. Faulty overflow valve, injection pump return. Swap injection pump relay with horn relay and retest. If supply pump previously failed (within the last 2-3 months) it could cause advance component and housing damage in the injection pump. Low or no fuel supply pump pressure, restricted fuel filter(s). Improper installation of replacement injection pump. Key not aligned with gear and gear pulled onto shaft with driveshaft nut. Injection pump drive gear installed one tooth off. Bad fuel Supply pump will normally cause this code. Could also cause a DTC P0216. Could set due to excessive cranking, see hard start diagnostics. If the engine still runs, check for fry grease, too thick of fuel can cause this code to set when the fuel is cold. If the engine is still running this code can set with improper fuel (fry grease) when fuel is cold and viscosity is too thick. Check fuel injection pump ground or low voltage. Swap horn relay with injection pump relay. Performance box issue, remove and recheck. Indicates no engine speed or position signal to ECM. Can cause other codes, solve DTC P0336 first. Bad CKP will cause multiple problems, such as surge, miss erratic run, hard start, no start, stalls, etc. If no other DTC, pump is likely faulty. Could be caused by a performance box. Can also be caused by a DTC P0336. Can be caused due to excessive cranking – See hard start & no start diagnostics. Wires chaffed at pump connection. Performance box problem, remove box and retest. Fuel pump relay bad (swap with horn relay and retest). Monitor RPM reading of the following: ECM engine speed (crank position sensor See DTC P0336) vs. engine speed CMP (cam position sensor) vs. injection pump RPM (from injection pump). The JTEC controller is reporting that there is a DTC stored in the ECM. Look in the other module for trouble codes, the vehicle has both a PCM and ECM. Some scan tools will not read codes in both modules at the same time. P1693 means – LOOK IN THE OTHER MODULE TO GET THE OTHER CODE! The following information has been put together to help you troubleshoot complaints and to better understand the basic operation of the engine and fuel system. The correct tools and service manuals for performing the repair procedures will be needed. Check that the shutoff solenoid is working and getting full travel. Bad ring terminal connections at the driver’s side positive battery terminal are common and may cause a no start/hard start condition. Restricted air intake, dirty air filter. Check throttle for full travel at injection pump. Stop to stop on the injection pump throttle lever, toward the rear of the pump. Loose or cracked boost line leading to AFC (aneroid) hosing in injection pump. Damage AFC diaphragm, check to see if it will hold a vacuum. Air in fuel system to injection pump. Pump to engine timing is retarded. If you have checked the fuel galley pressure and it is good, then you can try the following; after the vehicle sits overnight start the engine and as soon as the oil pressure gauge starts to move increase the to 1800 rpm. If the white smoke and miss are cleared up in less than 7 seconds, then the pump to engine timing is usually good. If it takes longer than 7 seconds to clear up the smoke and rough run you may need to check the pump to engine timing. Bad injector or pump problem. If you have changed the injection pump, and it ran fine for a shot time then starts missing, smoking or dies with no restart then the pump drive nut was not torqued correctly. Idle speed too low, idle speed should be 800-850 rpm minimum. If you have a start and die or a long crank time after the vehicle sits overnight then you may need to replace the return line off of the injection pump. The 5/16” rubber hose connects to the steel line on the back of the injection pump and is located behind the fuel filter housing. If the line is cracked or “checked” on the outside it will allow fuel to drain back overnight. Make sure to put a slight “camel hump” in the line to prevent fuel drain back (cutting the line too long will make it “hump” upward). The engine will start cold down to about 35 degrees without the intake heater working. The PCM gets a signal from the intake air temperature sensor and activates the heater via the air intake heater relays, if the air intake temperature is below 60 degrees. The heater will continue to cycle after the starting for a short time. The colder it is and the higher in elevation you are the more you need the intake heater for faster cold starting and reduced smoke. You can watch the volt gauge to see if the intake heater is cycling; it will drop to about 10 volts while the engine is running. Loosen each injector line one at a time and note which line does not make a difference on how it runs. When diagnosing a miss you can move the possible bad injector to a different hole and see if the miss follows it. If not then you are looking at a possible pump or engine problem on that cylinder. We do not see many injector problems on the 94-98 12 valve engine; they are usually good for 200k miles or more. Pump to engine timing is critical to performance. If the timing is retarded then you will have a low power and often a blue/white smoke complaint (worse cold). If you have white smoke and a miss when cold check the fuel galley pressure first. If the galley pressure is good (see overflow valve and supply pump) try the following on a cold start. A. Start the engine cold, as soon as oil pressure registers on the gauge increase rpm to 1800. The engine will smoke and miss, if the smoke and miss doesn’t clear within 7 seconds the pump to engine timing may need to be reset. Pump drive nut torque; clean gear and camshaft before installing, pre-torque to 10 ft. lbs, unlock the timing pins on the engine and injection pump. Final torque 165 ft. lbs (some manuals show 125 ft lbs…this is WRONG). Incorrect torque will allow the drive gear to slip resulting in white smoke or dies with no restart shortly after installation. Fuel galley pressure (check at inlet to injection pump) should be 20psi at idle and a minimum of 25psi at 2500rpm. If it is low, the most common problem is the overflow valve, but a weak fuel supply pump can also cause the same problem, as well as restricted fuel supply. Use pliers with a soft jaw and temporarily pinch the return hose off of the injection pump. The supply pressure should spike very quickly to 50 psi. If the pressure goes to 50 psi or above the overflow valve will need to be replaced. If not then you have a bad supply pump, restricted fuel supply (fuel heater screen or tank sock) or the fuel heater is sucking air. The shut down solenoid is controlled by two relays one for pull-in during cranking (70 amps) and one for hold-in during running. If the shut off solenoid doesn’t pull up be sure to check the relay and replace if needed prior to replacing the shut off solenoid. Look in your service manual for the wiring diagram. The turbo is “powered” by exhaust gas velocity (expanding exhaust gases). Revving the engine up while in neutral will produce low boost. To accurately measure boost pressure you must be under load, such as full throttle acceleration while driving. If you are lacking fuel (galley pressure) at the right time (timing) or have an exhaust leak (loss of exhaust gas velocity) the turbo will not produce the correct boost. Solve these problems first, before replacing the turbocharger. The turbo should spin freely while pushing the turbine shaft left, right, up and down while gently rotating the compressor wheel. The compressor wheel should turn freely by hand, if it doesn’t replace the turbocharger. Visually inspect the compressor wheel. The blades should not contact the compressor housing and the blades should not be chipped, bent or damaged in any way. Check the wastegate actuator for free movement while applying regulated air pressure, the wastegate should start moving open with about 20 psi applied to it (check the specifications for the turbo you are checking). The KSB unit on the injection pump uses a temperature sensor in the intake manifold to advance the pump timing when the engine is cold, which reduces blue/white smoke. 89 to early 91 used a wax motor style KSB unit that voltage is applied to, via the cold start switch, once the intake air temperature is above 160 degrees. 91.5 – 93 used a solenoid style KSB. The intake air temperature sensor applies 12 volts to the KSB solenoid until intake air temperature is above 90 degrees. Check for full throttle travel, worn levers or throttle spring on the injection pump can limit travel. As above, if the pump has a lot of metal in it, the metal can plug some of the spray holes in the nozzle tip. If there are holes plugged in the nozzles, find and fix the cause before replacing them (if the problem is in the pump, the replacement nozzles will soon plug as well). Pump to engine timing incorrect. Blue/White smoke, if during cold start, see cold start operation. Check intake air heater operation. Supply pump pressure should be about 4-5 PSI at idle and maintain positive pressure under load on the clean side of the fuel filter. The turbo is “powered” by exhaust gas velocity (expanding exhaust gases). Revving the engine up while in neutral will produce low boost. To accurately measure boost pressure you must have the engine under load, such as full throttle acceleration while driving. If you are lacking fuel (galley pressure) at the right time (timing) or have an exhaust leak (loss of exhaust gas velocity) the turbo will not produce the correct boost. Solve these problems first, before replacing the turbo. The turbo should spin freely while pushing the turbine shaft left, right, up and down while gently rotating the compressor wheel. The compressor wheel should turn freely by hand, if it doesn’t replace the turbo.